LOS ANGELES, CA / ACCESSWIRE / November 3, 2016 / Alex and Sorcha O'Connor, water sports fans from Edinburgh, UK, are pleased to announce the launch of their innovative Sealblades – World's First Retracting Hand Paddles. The Sealblades were invented by Alex, who has enjoyed waterskiing, wakeboarding, windsurfing and other water-related sports since he was a young boy. To learn more about the professional and talented team behind this innovative project and watch a video of the Sealblades in action, please visit https://goo.gl/u13To0. "Whether surfing, paddleboarding, or skimboarding is your thing, Sealblades will be an awesome accessory to add to your water adventure and get you paddling 35% faster than using hands alone," noted a spokesperson for the project, adding that the retractable hand paddles secure to the forearms with the help of a neoprene sleeve and adjustable straps. "While you're paddling, you hold the blades in place to help you propel through the water. Simply letting go will cause the paddles to snap back so you can go hands-free and go about your usual activities." Using the Sealblades will provide surfers with a great way to swiftly reach the waves they want to catch, while those staying out of the extreme conditions will enjoy being able to leisurely paddle through calm waters. "There is no limit to what you can use these blades for. No matter what sport you prefer, you'll be flowing through the water with new speed and enjoying exciting new possibilities," the spokesperson noted. Sealblades will be available in two sizes: Sealblades Zero features a full sized blade for stronger adults and Sealblades Zero Rush is a smaller, streamlined design for smaller adults and teens that has slightly less power and less resistance to make paddling easier. In order to help pay for the costs associated with getting the Sealblades into production, the O'Connors and their team recently launched a fundraiser on Kickstarter. There, they hope to raise $12,234 through crowdfunding to bring this awesome accessory to as many fans of water sports as possible. Sealblades are the world's first retracting hand paddles for surfing, SUP, boogie and prone paddle boarding. 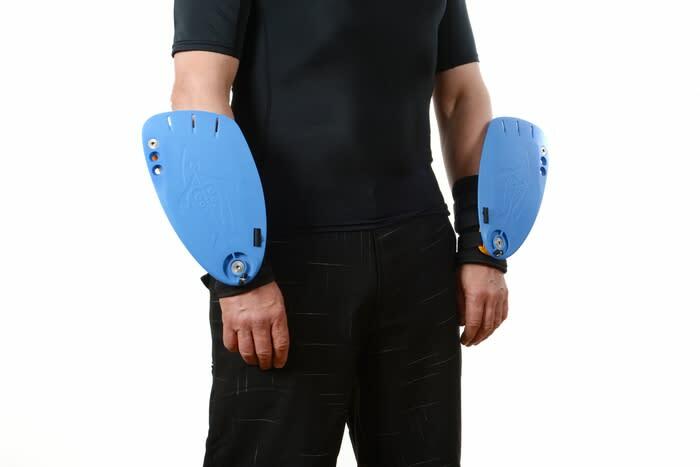 The hand paddles, which fit to the forearm with a neoprene sleeve and Velcro strapping, give the wearer up to 35 percent more paddling power. For more information, please visit https://goo.gl/u13To0.